Calls mounted on Sunday for French President Emmanuel Macron to bring an end to the ‘yellow vest’ crisis gripping France as authorities counted the cost of another day of violent protests and looting. Finance Minister Bruno Le Maire said the unrest was a ‘catastrophe’ for the French economy, with nationwide roadblocks playing havoc with the traffic and putting off tourists from visiting Paris. Government spokesman Benjamin Griveaux vowed that Macron’s centrist administration would find solutions that took into account protestors’ grievances. ‘It is clear that we underestimated people’s need to make themselves heard,’ Griveaux told Europe 1 radio. Alain Juppe, mayor of Bordeaux where a protestor lost his hand after picking up an anti-riot grenade, joined calls from across the political spectrum for Macron to respond. The embattled president – whose name rang out across the Champs-Elysees as protestors shouted ‘Macron, resign’ — is expected to address the demonstrations in a much-anticipated speech in the coming days. The protests have shown little sign of easing since they began on 17 November. In Paris, around 10,000 ‘yellow vests’ flocked to the Champs-Elysees and other areas. Nationwide, more than 2,000 people were detained – over 1,000 of them in Paris as police vowed ‘zero tolerance’ for anarchists, far-right supporters and others seeking to cause trouble. ‘The state cannot mobilise such forces every Saturday, and neither can shopkeepers barricade themselves in faced with violence which is not diminishing,’ he tweeted. 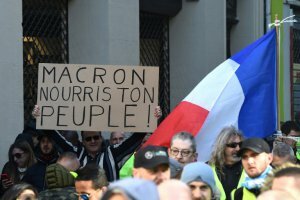 Macron has already offered protestors a string of concessions, including scrapping further rises in fuel taxes – a major climbdown for a president who had vowed not to be swayed, like his predecessors, by mass protests. So far he has refused to back down on another policy hated by the ‘yellow vests’: his decision to scrap a wealth tax. Far-right leader Marine Le Pen called for Macron to ‘recognise society’s suffering and deliver immediate, very strong responses’. The movement has spread beyond France’s borders, with around 400 arrested at a ‘yellow vest’ event in Brussels on Saturday and peaceful demonstrations taking place in Dutch towns. In France, authorities have also launched an investigation into social media activity from accounts allegedly drumming up support for the protests, sources told the AFP new agency. According to Britain’s The Times newspaper, hundreds of online accounts linked to Russia were used to stoke the demonstrations. Citing analysis by New Knowledge, a cybersecurity company, The Times said the accounts spread disinformation and used pictures of injured protestors from other events to enhance a narrative of brutality by French authorities.